A suitable replacement for the Xbox 360, and one possible way to tie all your home entertainment together. The interface needs some work, though, and a future ‘slimmed down’ version would be very welcome. It’s been eight years since Microsoft launched its last game console, the Xbox 360. Despite famous ‘Red Ring of Death’ problems and fierce competition from established competitor the Sony PlayStation, the humble 360 managed to bring a sort of balance to console gaming. Whatever their underlying hardware or abilities, the Xbox 360 and PS3 were largely matched in what they delivered to gamers. Only personal preference, or desire for a specific console-exclusive title – such as the Halo series on Xbox, or Killzone on PS3 – offered a real reason to choose one over another. From what we’ve seen so far, Microsoft’s Xbox One and Sony’s PlayStation 4 may end up at the same sort of détente in the console cold war. It’s hard to say right now, particularly having more experience with the Xbox One than the PS4. That brings us to why you’re here: how does the Xbox One fare on its own merits, after a week of intense in-home testing? The Xbox One is an almost featureless box, with vents on both sides and half of the top panel. It’s notably larger than the Xbox 360s, and looks a little less stylish without the gentle curves and svelte stature of its predecessor. All of the connections are on the rear, apart from a single USB 3.0 port near the front on the left-hand side. The Blu-ray disc drive on the front is slot-loading, and the only physical controls are ‘eject’ and ‘power’ buttons on the front surface of the console. The power button is touch-sensitive, disguised as an Xbox One logo. There’s one problem with the design, that will only affect some users: unlike the Xbox 360, the Xbox One will not stand up on one end. It must be laid flat, like a DVD player. If you have a great big entertainment unit, that’s no problem. However, I live in a small apartment with minimal storage space. I use the Xbox with a 23-inch monitor, not a big TV, and have it perched on a table in the lounge. I’ve seen many console gamers that do the same thing, having the console set up more like a desktop PC than a set-top box. Not being able to stand the Xbox One up like a tower-PC made a mess of my setup plans, and I had to move it to my dining table to make room during testing. At Xbox community LAN events, where you’ll have hundreds of Xboxes set up side-by-side like PCs in a computer lab, it’s going to pose even more of a problem. The next big Xbox event I’m attending is in January – I can’t imagine what we’re all going to do then. It’s possible to perch a screen on top of the Xbox One, but not recommended. Much of the ventilation is on the top of the case, which I really wouldn’t want to block. The new Kinect sensor included with all Xbox One units is a little bulkier than the original Kinect, and includes its own cooling fan. All Xbox Ones ship with the new Kinect sensor, once an optional extra for the Xbox 360. If you’ve been living under a rock (or out of the gaming world for a while), the Kinect combines a camera, infrared depth-sensor and microphone to enable motion and speech-controlled gaming. The new Kinect is bulkier than the original, and includes its own cooling fan. It sits on a tilting base, which lets you sit the connect in front of the TV. We had a better experience with the Kinect just above the TV screen, particularly when sitting close and using the Xbox One like a gaming PC. However, the stand does not facilitate mounting on top of modern flat-screen TVs. A tripod socket in the base of the tilting stand lets you mount the Kinect to any standard photographic tripod or support-device. This lets you use a cheap tripod standing up behind your TV, or something like a Gorillapod to hook it on to the top edge of a flat-screen. We used the former method with a cheap store-brand tripod, and it worked fantastically. A tripod socket in the Kinect’s base makes it compatible with any standard photographic tripod, which can provide a cheap and easy way to get the perfect sensor placement for your room. Though it was feared early on that the Kinect would be an ‘always connected’ affair, it can be left unplugged if you don’t wish to use motion control, voice command or Skype features. The Xbox One ran fine in all of our gaming tests with the Kinect unplugged, simply with those features absent. The new controller is an evolution of the original, rather than an outright redesign. Slimmer in some parts, thicker in others, I found it fit my hands slightly more comfortably than my own Xbox 360 controller. That was especially apparent after long gameplay sessions. The buttons are all in much the same places as the original, and there’s no learning curve if you’ve used an Xbox 360 before. The only change that briefly stymied me was the change from the triangular-iconed ‘Start’ button to a little three-line-iconed ‘menu’ button. It’s in the same place and serves the same function, but the original notation seemed slightly more appropriate based on what the button usually does. Just something to get used to, I guess. As was much discussed prior to the launch, the Xbox One is not compatible with Xbox 360 headsets. Specifically, the socket on the controller required to provide voice-chat functionality has been redesigned from a standard 2.5mm minijack to a new proprietary connector. The Xbox One is not compatible with Xbox 360 headsets. Sets such as the Astro A30 (pictured) will work as headphones, but won’t provide voice chat functionality. Headsets that used the optical audio output on the Xbox 360, such as the Astro A30 (pictured) will work as headphones, but cannot connect to the Xbox One controller to provide voice chat functionality. Thus, single-player gamers are unaffected by the change. This may seem like a minor inconvenience, but headsets have been a major area of investment for many Xbox 360 gamers – particularly those who play competitively and/or at community LAN events. It’s possible to spend anywhere from $300-$500 on a high-end headset suitable for competitive play, and potentially even more on the sort of noise-blocking headsets you might use on stage in front of a large, noisy crowd. I spent almost as much on my own Astro A30 headset as I did on my Xbox 360. Adapters may be released in future, but presently, gamers upgrading from an Xbox 360 can’t use their existing headsets for chat. With the standard chat headset connected, mute and volume controls are added to the bottom of the Xbox One controller. During playtesting, the extra controls had no impact on our grip of the controller, or our comfort. Following on from previous generations, the Xbox One includes a basic mono (one-ear) chat headset with a boom mic – you’d use this in conjunction with speakers, as it doesn’t deliver game audio. In a nice touch, the headset adds mute and volume controls to the bottom of the controller when plugged in, placing them in easy reach at all times. At this early stage, we’ve spent more time examining and testing the Xbox One itself, than the games it runs. We’ve seen those games, and played a few before at public events – we know they look good, run smoothly, and generally behave as their Xbox 360, PC or PS4 counterparts would. Game reviews will follow soon, but we started with the hardware. Most of our playtesting to date has been with Capcom’s Dead Rising 3, a semi-sandbox zombie-slasher that follows on from one of my personal favourites, Dead Rising 2. When I say “follows on”, I mean “has very little to do with, bar a common universe and mechanisms of zombie dismemberment”. But that’s enough. No Dead Rising protagonist has enough character depth to survive transplantation into a sequel. 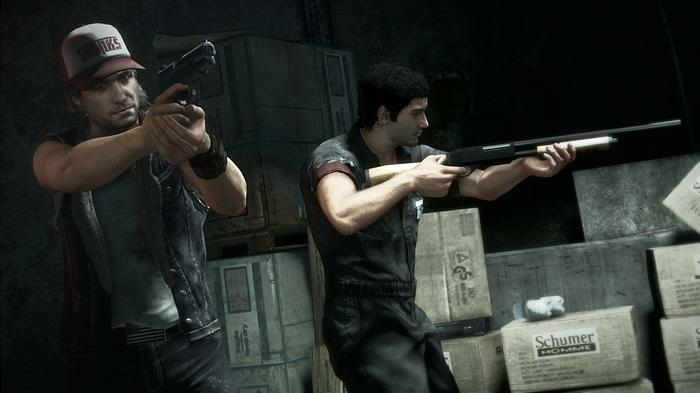 Dead Rising 3 makes very basic use of the Kinect, both with gestures and audio. It’s possible to give in-game characters simple “go there” and “attack”-type instructions by voice, which they’ll generally obey. You can also a zombie’s grasp by flailing your arms around, in the most player-aware implementation of motion controls I’ve ever seen – I mean, that’s exactly what I do when I’m wading through a crowd of zombies, and one manages to latch on to me rather than my machete-on-a-stick. The graphics in Dead Rising 3 – along with other games we’ve looked at such as Forza 5 and Ryse – are beautiful. Truly the sort of thing you’d see from a high-spec gaming PC, and a notable jump from the Xbox 360 or PS3. The usual trend is for graphics to improve as game developers become more familiar with the new consoles, so I do have high hopes. You’re still going to set your graphical ceiling higher with a custom-built, wallet-destroying PC, but what the AU$599/NZ$749 nets you is far, far above what a comparably-priced PC could ever hope to deliver. Game consoles are PCs, at heart, and that’s the comparison you need to make. For what you’re paying, you’re getting an unmatchable gaming experience. Well, by anything but the closely-competing PS4. Which looks and plays better, Xbox One or PS4? Ask me when I’m a half-dozen game reviews in. At this stage, it’s anyone’s game. Following Microsoft’s post-E3 turnaround, disc-based games are lendable and not linked in any way to your Xbox Live account. Games bought via Xbox Live download, just like those purchased on PC via a service like Steam or Origin, are linked to your account and not to a specific console. This is all carried over from the Xbox 360, which is exactly the way it should have been. In my humble opinion, anyway. Since its initial announcement, Microsoft has been pushing the Xbox One as an all-purpose entertainment device. Part of that is down to support for YouTube, services like Xbox Video and Xbox Music, and video Skype calls via the Kinect. The inclusion of a Blu-ray drive, previously only found in Sony’s PS3, also boosts the One’s usefulness as a media appliance. However, the core functionality is the Xbox One’s HDMI input, and everything Microsoft has built around it. On the back of the Xbox One are HDMI inputs and outputs, an optical S/PDIF audio output, two USB 3.0 ports, a proprietary port for the Kinect sensor's cable, and an Ethernet port. Wi-Fi is built in. The idea is that you connect the output of your Freeview box, Sky decoder or other television-source to the Xbox One’s HDMI-in port. You set up your devices – that box, your sound system, whatever else — with the Xbox One, and it looks up all the infrared remote control codes for those devices online. You issue a voice command like “Xbox, watch TV”, and the Xbox switches on that HDMI input, sends the remote-control signal to power on your TV, and voila — your existing television services, however you prefer to acquire them, via the Xbox One. Taking it one step further, an electronic programme guide (EPG) on the Xbox One allows you to browse what’s showing, select a programme, and the Xbox will send the remote control signals to your decoder to change the channel as necessary. Well, yeah, if any of it worked in New Zealand. Voice commands will not work unless you switch your region from New Zealand to US, and the EPG is not currently available in New Zealand at all. It’s possible to get the “Xbox, watch TV” part working at least, but currently you still need to change channels the old fashioned way, using your Freeview or Sky remote. Once it’s all up and running in our region, I suspect the Xbox One will provide a nice way to tie all of your entertainment devices together under a single interface. Until then, however, there’s not too much I can say on the feature. Personally, I don’t watch TV at all – just by providing Xbox Video, Xbox Music, YouTube and a web browser, the Xbox One has already centralised my home entertainment into a single box. If you’re the same, well, you’ve got nothing to wait for. One of the things that led me to choose an Xbox 360 over a PlayStation 3 was the 360’s beautiful, clean, simple, user interface. I’m sure there’s a degree of preference involved, but I really found Microsoft’s interface far more intuitive and more easily navigable than Sony’s. Oh, how terribly disappointed I am to see that the Xbox One didn’t follow its predecessor’s great example. The Xbox One does not have a terrible UI, but nor does it have a great one. It seems to be a mix of Xbox 360 and Windows 8, with live tiles and pinning and big squares of colour all over the place. The 360 did ‘big squares of colour’ simply. On the Xbox One, there were aspects of the menu that I still hadn’t quite worked out after a week. Call me an idiot if you’d like – it won’t make it any easier for me to get around the Xbox One’s desktop-menu-slideshow-nightmare. Okay, okay, ‘nightmare’ is an exaggeration. There was never anything I wanted to do, that I simply couldn’t. Still, there were myriad small things that left me scratching my head. Once I was in-game, and the UI belonged to the game developers, everything was fine. However, the Xbox One is drastically in need of an ‘Xbox One-point-one’ update to tweak and streamline the UI into something slightly less convoluted and more consistent. It wouldn’t be enough to put me off buying the console for gaming, but it does make its ‘whole family’ entertainment features and apps slightly less accessible. Altogether, I like the Xbox One. If my own Xbox 360 stopped working, I’d replace it with a One. When I have to give the review console back to Microsoft’s PR firm, I’ll be looking at prices and working out whether I want to keep playing all the new games they’ve sneakily got me hooked on. I would not, however, rush out and replace my Xbox 360 tomorrow. The Xbox One is a great new gaming console, or a great replacement – what it offers as an upgrade is questionable. If the games you want to play are still on 360? Stick to the 360. When some Xbox-One-Only game comes out that you desperately want to play – I’m thinking for many people that’s going to be the next Halo – then that’s when you buy. That advice isn’t for everyone, of course. If you play competitively online, or cooperatively with friends, an upgrade may be in the cards just because most of your peer group is doing it. Peer pressure: selling consoles since multiplayer hit the market. If you’re tossing up between an Xbox One and PS4, that’s an even tougher decision. If I were you, I’d wait ‘til our PS4 review is up, and we’ve had a chance to compare the two feature-for-feature. Games might again play a factor here – if you desperately want to play Forza 5, it’s the One. Killzone: Shadow Fall? PS4. Destiny or Watch Dogs? Well, many upcoming releases not only give you the choice between Xbox One and PS4, but their older equivalents as well.